- The club's name is present on the back of the neck. - On the inside of the collar is the club motto; "a vencer desde 1893" (wining since 1893). I always wanted a camo style club football shirt and this is pretty much as close as I've got. The diagonal lines covering up the camouflage pattern is a unique and interesting style. I'm not 100% certain if it is a good look or not but they certainly get two thumbs up for originality. I feel if maybe the camouflage design ran to the bottom of the shirt or towards the edge of the sides and not being located in a section on the front, that it would look better. 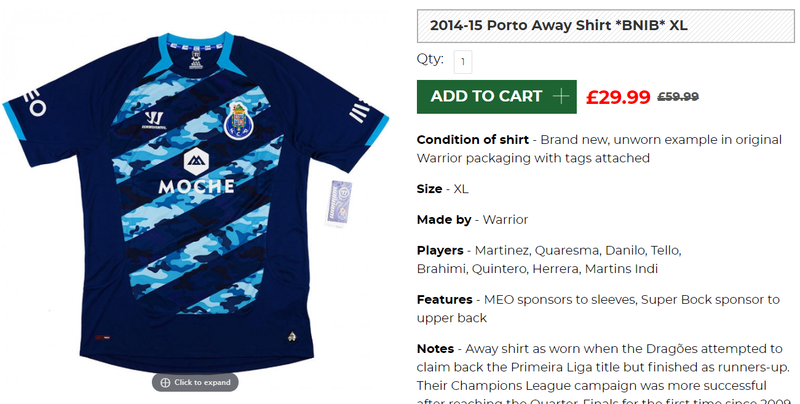 If the above has given you some inspiration to buy an FC Porto shirt then why not buy one of theirs from this season. Clicking on the photo will take you to the retailer.